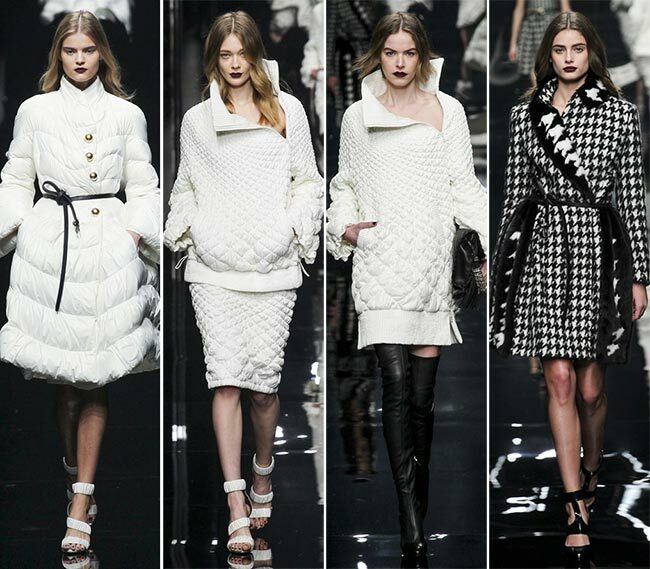 The Ermanno Scervino fall/winter 2015-2016 rtw show began with lovely music, the first of the pieces walking out in a lovely white bubble coat, tied at the waist with a looping rope and with round gold buttons down the chest. 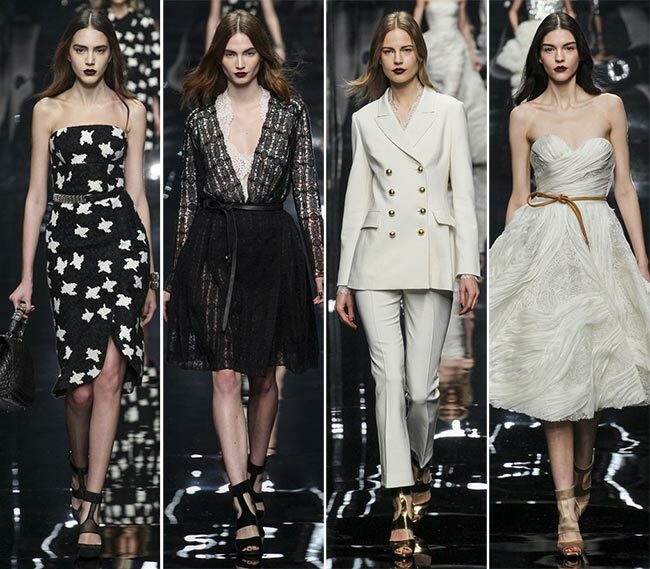 That bubble look continued on quite nicely with pieces in skirt and jacket ensembles. 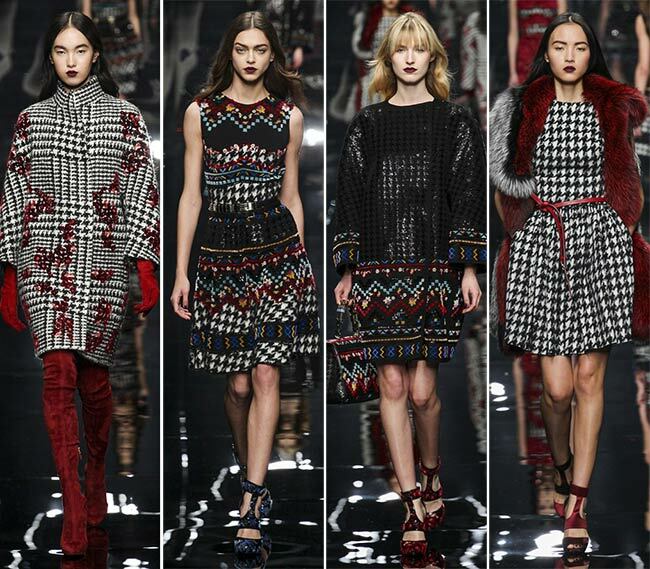 Houndstooth dresses also made the cut, both in just black and white and then with scarlet splashes. 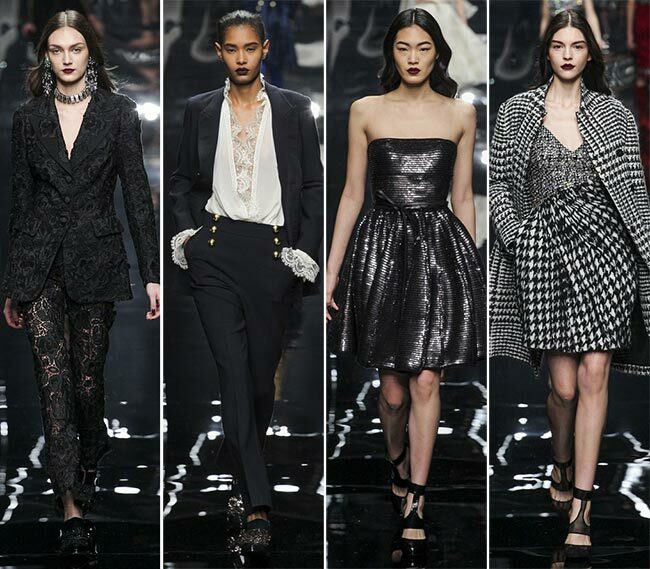 The dresses did seem to have a rather intriguing allure to them, particularly when Scervino decided to mix scarlet satin with floral designed beaded palettes with the black and white houndstooth patterning. 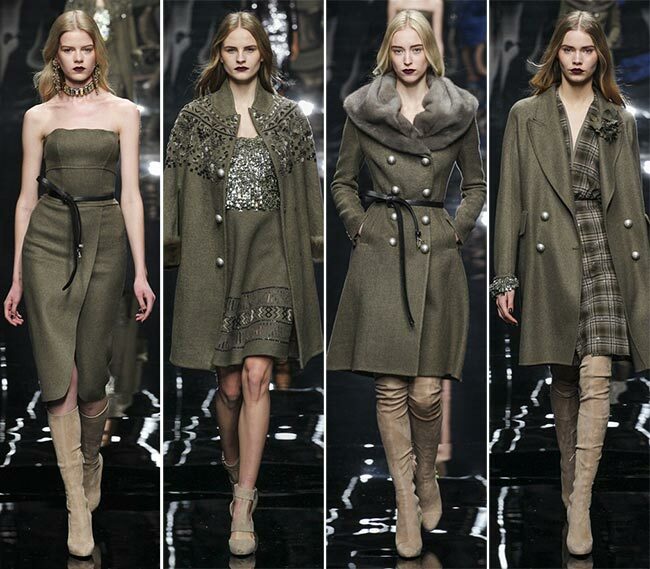 The Ermanno Scervino brand is the core of the fashion house, including men’s and women’s ready to wear collections, along with accessories. It also has a lingerie and beachwear line launched in 2009, along with a label for younger people taking its inspiration from the adult lines. The Scervino Street brand was created in 2013 and offers a nice line of handbags to the more youthful clientele it serves. While so many of the Italian fashion houses were founded in the 1900s, Toni and Ermanno Scervino brought this particular house to its feet in the year 2000, as a celebration of life when it became clear that entering a new millennium would not destroy everything in sight. The first women’s collection debuted on the Milan Fashion Week runway in 2003 and we’ve enjoyed their lovely creations ever since. A lovely lace piece in strapless was presented, the waist cinched in with a rope tie, an accessory common to the entire Ermanno Scervino fall/winter 2015-2016 collection. The pantsuits were very nicely tailored, looking perfect for the professional woman who has the brains to climb the ladder and needs the perfect suit to show off her fashion sense is not compromised by her abilities. Plus, she gets to wear lace outfits and when she plans on going on a date, she can change into a gauzy dress with a plunging neckline and leather rope belt tied at her waist finished off with some of the nicest heeled sandals on the runway this week. 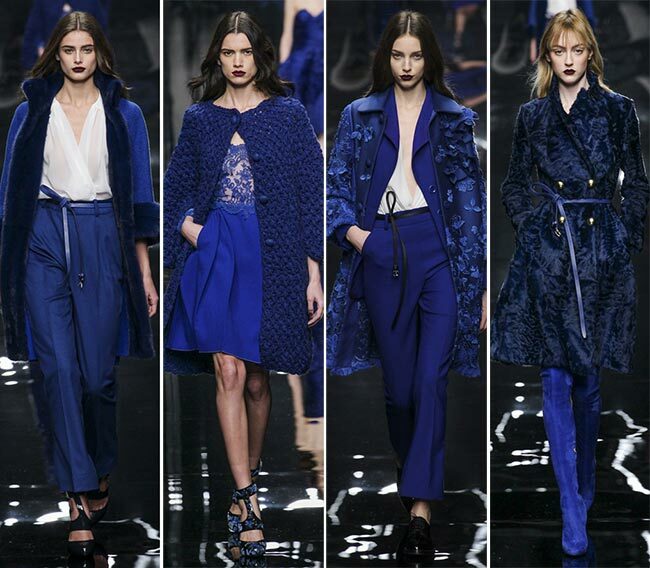 While it starts off with the black and white focus, soon the color scheme develops to include a deeper and darker blue before slipping into caramel and camel colous, slipping into olive hues that accentuate the natural coloring of a woman from the West. 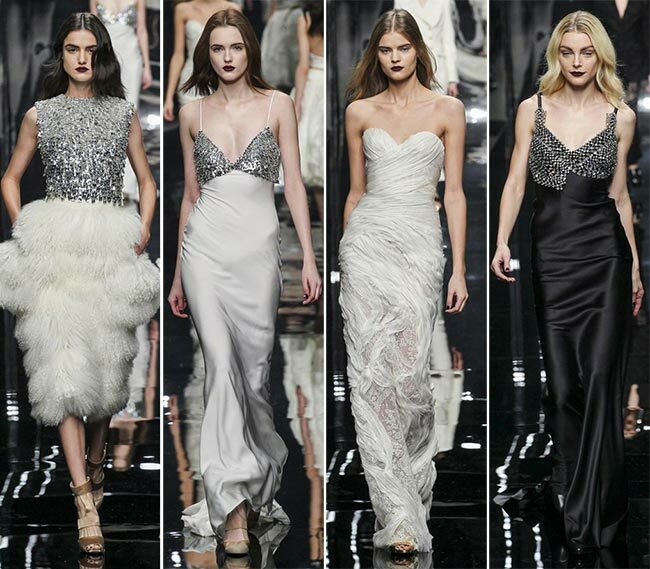 The glittering sequins in matte black that take over the last few pieces before moving on into white crepe and ostrich feathers do much to catch one’s attention, making an appearance on white sheath gowns as well. The ivory coloring of the wedding dresses with the detachable train and the strapless chest, made in crepe has us thinking of our own weddings and the type of gown we would hope to wear. The look is delectable in itself, while we know we’ll be seeing a few of these on the red carpet as well, particularly the satin sheath with the long train and the black sequins adorning the bust region. It was certainly a beautiful collection to watch and we look forward to perhaps getting our hands on a few of these lovely pieces.